An evocative portrait by Ballarat artist Kim Anderson exploring the isolation of an eating disorder has taken out the 2014 Office of the Public Advocate Prize. 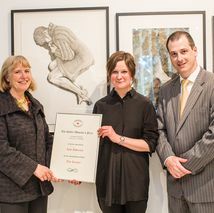 Announced at the Yarra Gallery in Federation Square last night as part of the State Trustees CONNECTED Art Exhibition, Kim received a $500 prize for The Burden. Her work is one of more than 150 from across Victoria by artists with a disability or experience of mental illness in the exhibition. You can view Kim’s work and artist statement in the online gallery. The exhibition runs until 28 October and is open from 10am to 6pm daily.